How Much Does Big Lots Pay? How Old to Work at Big Lots? Does Big Lots Drug Test? Are you interested in Big Lots careers? If so, this guide could be just what you need to help boost your chances of successfully gaining employment. Stocking a range of both unique items and heavily-discounted big brand products, Big Lots’ “surprises in every aisle” keep customers coming back. The variety of tasks can make for an interesting work day. Joining the team means you could become part of this thrilling environment for savvy shoppers. Through sharing details of current vacancies, the application process you can expect, and information about Big Lots, this guide can help you become part of a community based on exceeding customer expectations, passionate leadership and, of course, fun. Read on to find out what you need to know about opportunities at Big Lots. We will tell you how to give yourself the best chances of landing various positions. Those include: Store Associate/Stocker, Customer Care Specialist, Furniture Sales Lead or lead of another department of the Store, General Office and Distribution Center vacancies. Applying for jobs at Big Lots is as easy as going online and filling out a form. As you’re online already, you’re halfway there. Navigate to the Big Lots careers page. Choose whether you’d like to apply for a job in a store, office or distribution center. Then, filter by region or role to narrow down the results. As a store associate/stocker at Big Lots, you could spend your days carrying out a variety of tasks. Those may vary from cashiering and carry-outs to merchandise presentation and recovery. This job may be suitable if you have previous retail or cashiering experience. You’ll need to be able to move freely across store and stockroom floors during a shift. You will also need to be able to lift, push, pull and carry various items. They could weigh more than 50 pounds. If you’re willing to work hard in a varied role, have basic reading and math skills and can be flexible with your working hours, this Big Lots job could be a good match. Big Lots currently has a few different material handler vacancies. Those include jobs with both full-time and part-time hours. This role involves receiving, picking, sorting, transporting and loading merchandise for online orders, among other responsibilities. You’ll need to have a valid driver’s license to operate any powered equipment. You will also need the ability to work at heights and deal with potentially heavy loads. They prefer that you have previous experience in a similar role. They also want to see a proven track record of excellent customer service. If you have effective written and spoken English and math, can work well in a team and on your own, and can handle multiple tasks, you may be a good fit for this role. This part time store-based role involves a range of tasks. Those include, but are not limited to, cashiering, customer service, truck unloading, recovery and light cleaning and maintenance. Hours of work are variable. A good candidate for this Big Lots job will have a High School diploma, GED, or equivalent. They will also have excellent customer service and communication skills. In addition, it would be good to have retail leadership experience. It will also help to be physically fit enough to deal with heavy loads and a demanding job. To land a lead support associate job, you’ll need to be at least 18. A customer care specialist is a general office-based role suited for those with outstanding customer service and communication skills and, preferably, around 2 to 4 years of relevant experience. As the job involves dealing with customer inquiries. You can expect a variety of requests during each shift, with responsibility for investigating, resolving and responding to telephone, mail, e-mail and any other communications which arrive. You’ll need to collaborate with other departments to make sure Big Lots customers receive the best care possible at all times. Multi-tasking, learning how to use new software systems quickly, and excellent problem-solving skills are essential. This role involves working on the e-commerce side of Big Lots business, working with others to plan and implement merchandising on the website, and improve product marketing. Some of the responsibilities you could be taking on include running and producing reports and daily updates, keeping links and launch dates accurate, and presenting and investigating various aspects of e-commerce. You’ll need strong analytical skills to thrive in this role. A suitable candidate for this role will have excellent Excel and Word skills, strong analytical skills, and previous experience in a retail environment. They would also prefer that you have a college degree in a business-related field. As well as the jobs already listed, Big Lots have a range of manager jobs currently available. Again, these span store-based, general office and distribution center roles, with a variety of responsibilities. Current manager jobs include Store Team Leader, Store Manager, who’s accountable for all aspects of store operation, from financial performance and company initiatives to improving efficiency and profitability. District Team Leaders take responsibility for all stores within a district, with emphasis on improving profitability and efficiency, while ensuring full compliance with company standards. Leadership and guidance of store manager is also a key aspect of the role. In the distribution center, the Fixture DC Manager oversees daily operations of Fixtures, making sure receipt, storage and processing is carried out in a timely and efficient manner. Another current manager level vacancy is that of IT Service Center Manager, providing support and direction to Big Lots’ first-line support teams. When working for Big Lots, you can expect a range of benefits such as healthcare, medical, dental and sick pay. There’s also an employee relocation assistance program available where required, merchandise discount and competitive holiday and bonus programs. 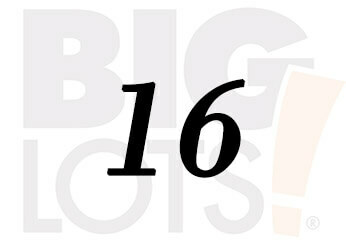 The overall minimum age to work at Big Lots is 16 for most entry-level positions. Manager or more senior jobs generally require applicants to be at least 18, with some relevant experience. Big Lots does not normally drug test during the recruitment process, but may do so if there are any accidents during a shift. Former employees in certain regions have reported drug tests prior to being hired. If a drug test is required, you can expect it to be a standard drug test. Bear in mind that background checks may also be carried out. Why do you want to work for Big Lots? Be prepared for this question, as it’s a very common one. Familiarize yourself with the values and mission of Big Lots, and think about how to use these in your answer. Try not to fall back to the standard “seeking a new challenge”, you can do better than that. In retail, the customer is king and excellent customer service is incredibly important. Think about outstanding customer service you’ve received in the past and how it made you feel. If you have previous retail experience, make sure to have an example ready of a time when you provided great customer service. Read through the job description when preparing your answers to make sure you tailor them appropriately. Being as flexible as possible can help improve your chances of success at interview, but don’t promise what you can’t deliver. If you have childcare or other commitments that cannot be moved, be honest at the interview. Don’t try to demand set hours on a variable job, as you may need to make some sacrifices for your new career. If you’re applying for an entry-level position at Big Lots, you may prefer to wear business casual attire to your interview, while a manager-level role requires formal dress. However, if you really want to make a good impression, professional attire is a good idea even for entry-level. Looks to be great store to work in. Does this company do credit checks for potential management applicants? Hi this is Terry Glover. I have applied for a job at the Big Lots in West Valley City, Utah. I called on it and they said I have to do the background check. They said I would get an email, but I have not received one, so how do you suggest I go about that? Hi Terry! How long has it been since you applied? I’d recommend giving it a few days before you follow up with the store again. If you still haven’t received an e-mail by later in the week, perhaps it would be worth another phone call to the hiring manager at Big Lots you spoke with previously.